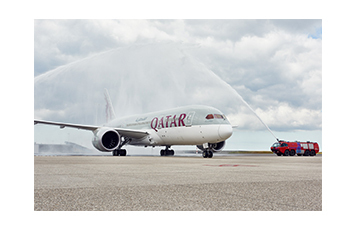 Qatar Airways, the award-winning five-star airline, has commenced services between Amsterdam and Doha with the inaugural flight landing at Schiphol Airport on Tuesday 16 June, welcomed with a traditional water cannon salute. Amsterdam is the airline’s first destination in The Netherlands and its 34th in Europe. Passengers who arrived on board the inaugural flight were welcomed by hostesses in traditional Dutch dress and were presented with wooden tulips as part of the celebrations. Departing passengers and guests also enjoyed the celebrations with light entertainment at the gate prior to embarking on the return flight. Marwan Koleilat, Qatar Airways Chief Commercial Officer, who led a delegation to celebrate the inaugural flight and was welcomed by Maarten de Groof, Chief Commercial Officer of the Schiphol Group, said: “Qatar Airways is proud to celebrate our much anticipated arrival into the beautiful city of Amsterdam, and we thank Schiphol for such a grand and colourful welcome. atar Airways Chief Commercial Officer, Mr. Marwan Koleilat (third right) and Chief Commercial Officer, Schiphol Group Mr. Maarten de Groof (third left), cut a ceremonial ribbon upon arrival at Amsterdam Schiphol Airport. 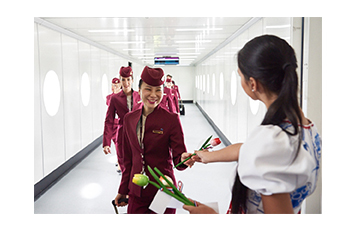 Cabin crew disembarking from Qatar Airways’ inaugural B787 flight are greeted upon arrival in Amsterdam. 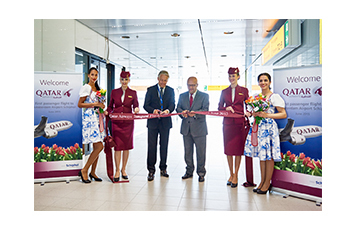 Amsterdam welcomes Qatar Airways’ inaugural flight on 16 June at Schiphol Airport. 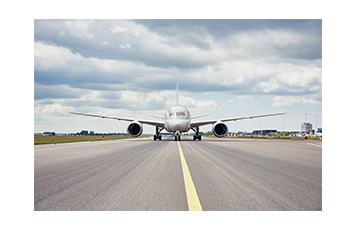 Qatar Airways will operate six flights per week between Amsterdam and Doha with the Boeing 787, which offers 22 seats in Business Class and 232 seats in Economy. This new service allows passengers to benefit from convenient connections at HIA while experiencing the finest service in the sky. Qatar Airways’ Boeing 787 Dreamliner provides passengers the very latest inflight experience, with Business Class passengers enjoying an enhanced travel experience with 80-inch fully flat beds, 17-inch televisions screens, Qatar Airways’ five-star food and beverage service – which is served ‘dine on demand’ – and a beautifully designed cabin, which minimises traveller fatigue. Similarly, Economy Class passengers can relax and enjoy the more than 2,000 entertainment options on the 10.6-inch inflight TV entertainment system and relax in one of the most spacious cabins in the sky.